As the population continues its rapid growth, food is becoming increasingly scarce. By the year 2050, we will need to double our current food production to feed the estimated 9.6 billions mouths that will inhabit Earth. Last week, Dr. Ramon G. Leon of North Carolina State University and Maggie Monast of the Environmental Defense Fund spoke at Duke's monthly Science & Society Dialogue, sharing their knowledge of what's known as "precision agriculture." At its core, precision agriculture is integrating technology with farming in order to maximize production. It is easy to see that farming has already changed as a result of precision agriculture. The old family-run plot of land with animals and diverse crops has turned into large-scale, single-crop operations. This transition was made possible through the use of new technologies—tractors, irrigation, synthetic fertilizer, GMOs, pesticides—and is no doubt way more productive. So while the concept of precision agriculture certainly isn't new, in today's context it incorporates some particularly advanced and unexpected tools meant to further optimize yield while also conserving resources. Drones equipped with special cameras and sensors, for example, can be flown over thousands of acres and gather huge amounts of data. This data produces a map of things like pest damage, crop stress and yield. One image from a drone can easily help a farmer monitor what's going on: where to cut back on resources, what needs more attention, and where to grow a certain type of crop. 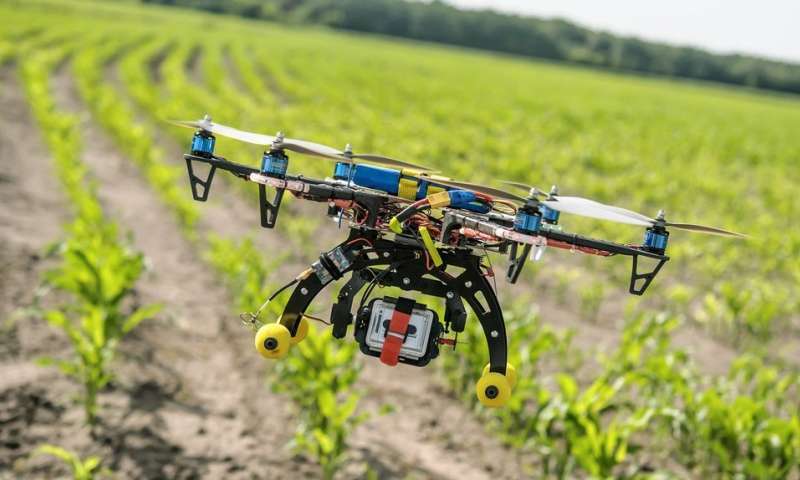 Some drones can even plant and water crops for you. Blue River's "See & Spray" focuses on cutting back herbicide use. Instead of spraying herbicide over an entire field and wasting most of it, this machine is trained to spray weeds directly, using 10% of the normal amount of herbicide. One problem preventing these technologies from really taking off is teaching the farmers how to take advantage of them. As Dr. Leon put it, "we have all these toys, but nobody knows how to play with them." However, this issue can resolved with enough time. Some older farmers love messing around with the drones, and the next generations of farmers will have more exposure to this kind of technology growing up. Sooner or later, it may be no big deal to spot drones circling above fields of wheat as you road trip through the countryside. Precision agriculture is fundamental to the modern agricultural revolution. It increases efficiency and reduces waste, and farming could even become a highly profitable business again as the cost for these technologies goes down. Is it the solution to our environmental and production problems? I guess we'll know by 2050!